GLMS President, Ludovico Calvi, attended the ICE VOX Conference on February 4th 2018 in London, UK. Ludovico was part of the high-level panel “State of the States: Sports Betting in the USA” focusing on the legislative outlook and sports integrity matters in the US market following the recent Department of Justice’s (DoJ) opinion on the Wire-Act.Ludovico presented GLMS mission and the role of the Lotteries within the US Sports betting landscape. While the original Federal intent of prohibiting legal sports betting throughout the US was to preserve sports integrity, unfortunately the opposite effect was observed with the development of a massive and undetected black market. GLMS President highlighted the importance of a regulated and sustainable sports betting market environment in each US state and recalled the need for all public and private stakeholders to come together and cooperate effectively to establish economically viable market conditions. 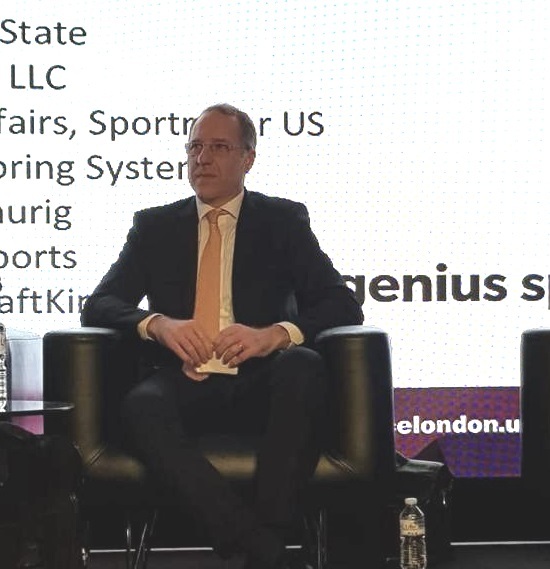 While it is important to invest resources in market driven product solutions, responsible gaming and integrity services, it is vital to create a feasible fiscal environment, which will enable legal, regulated sports betting to compete against the black market.He highlighted that US Lotteries are very well positioned to play a key role in the US Sports Betting legalization process. US Lottery operators, who will offer Sport betting products, will generate value on more traditional gaming verticals as it has happened in the experience of other Lotteries worldwide with proven success stories in both retail and digital channels.However, the biggest challenge, so far, for US gaming operators and US Lotteries, in particular, is the lack of clarity and potential damaging consequence of the DoJ’s revised opinion on the Wire Act.